After everyone started to adore Laura Mercier's Candlglow Foundation (http://bit.ly/2fnNLdJ) $48.00, she knew she had to come up with something for the under eye area that also gave it that signature glow. So she came up with Candleglow Concealer and Highlighter. What is it? It is a concealer and highlighter for face and the under eye area the gives sheer coverage with a soft luminous finish. Just click, conceal and brighten! More than a concealer, more than a highlighter, this versatile formula lightens darkness as it minimizes visible discolorations and creates a soft, luminous glow: instantly awakening skin. 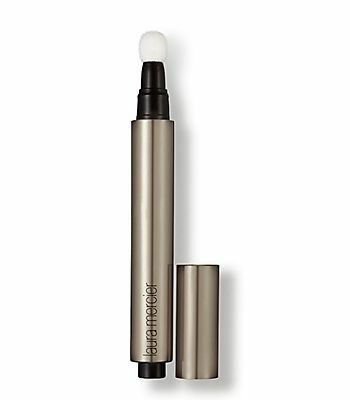 The innovative applicator is designed to fit in the contour of your eye and is ideal for brightening under eye darkness. It works all over your face to add highlights, lightens shadows around the nose and mouth or tones down imperfections anywhere. It flatters skin with a flawless, candlelit illumination. What's great is that this under eye and face formula gives sheer coverage with a soft, luminous finish.It's ideal for all skin types. The formula is non-comedogenic and dermatologically-tested. The concealer/highlighter comes in seven shades in all, in cool undertones and neutral undertones. It comes in one shade in the cool undertones: 0.5 (Fair). The other shades are all Neutral Undertones: 1 (Fair to Light), 2 (Light), 3 (Light to Medium), 4 (Medium), 5 (Medium to Deep) and 6 (Deep).I wear the 0.5 Fair shade, as i always wear the lightest shade in any foundation, concealer and highlighter that is on the market. The Fair shade works very well as a concealer for me though, not as a highlighter obviously, as it is too close to the color of my skin. The best way to apply the concealer is to click the button at the bottom of the tube and then wait until some has appeared at the top on the sponge. Then dot some under the eye. Blend it in. It goes on smoothly, blends easily, just pat it with your index finger. The concealer is sheer but not too sheer. I love how it makes the undereye area glow just slightly. I have not used it as a highlighter, so I cannot speak as to how well it works as one. Laura Mercier Candleglow Concealer and Highlighter retails for $32.00. It can be purchased online at www.lauramercier.com, www.sephora.com, www.macys.com, www.bloomingdales.com. www.nordstrom.com, and any door where Laura Mercier is sold. Like Laura Mercier on Facebook: https://www.facebook.com/lauramerciercosmetics?ref=br_rs; Follow Laura Mercier on Twitter: @LauraMercier; Follow Laura Mercier on Pinterest: https://www.pinterest.com/lauramercierusa/ and Follow Laura Mercier on Instagram: https://instagram.com/lauramercier/?ref=badge.